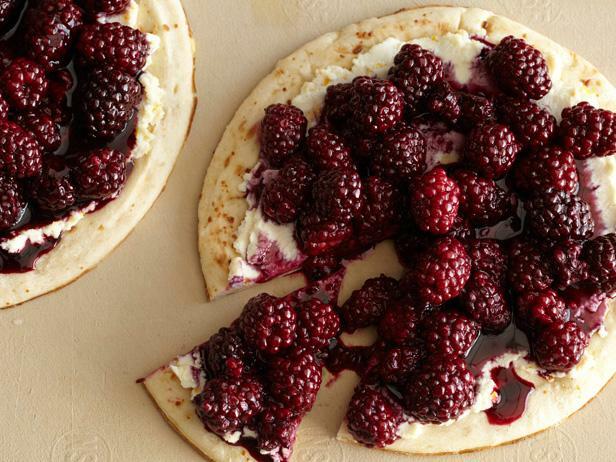 A very special dessert using red wine and blackberries as the topping over a creamy ricotta cheese filling. Dovetailing Tip: Use the pizza crust you made to make today's pizza. In a large skillet, reduce the red wine by half over medium heat and whisk in the confectioners' sugar. When the mixture thickens slightly, gently stir in the blackberries and simmer, 2 to 3 minutes. Set aside. Put the ricotta in a separate bowl. Grate a little orange zest (about 1 teaspoon) over the ricotta, add a pinch of salt and stir to blend. Spread an even layer of the ricotta on the pizzas and place on the grill to warm them. Alternatively, bake for 3 to 5 minutes in oven. Warm the blackberry mixture. Note: if the blackberry liquid is thin, strain the blackberries out and reserve them. Reduce the liquid until thick and mix it back in with the blackberries. Top the pizzas with the fruit and serve immediately. Dust with additional powdered sugar, if desired.